This line of JACKSONs has pricked my curiosity on two counts. : Firstly, the fact that the first George JACKSON is referred to as a Gent, and a successful merchant, and that he was also probably associated with the leather trade - aka a cordwainer. There are a significant number of other JACKSONs in the leather trades in Ireland in this time frame, and whose holdings would suggest that they shared a similar social status: Gilbert JACKSON (1677-1723) and James JACKSON (1669-1711) both of Co. Down; Joseph JACKSON in Co. Monaghan (father of Richard JACKSON 1769-1836); Robert JACKSON (abt 1650-1711) of Crooked Staff in Dublin; William JACKSON of Killmainhorn, Co. Dublin; Daniel JACKSON of Athy, Co. Kildare in a 1709 deed; and Richard JACKSON active in shipping tanned goods in the late 1600s in Drogheda. The Townland of Steeple is in the Parish of Antrim. JACKSONs also had holdings at Loonburn which is in the northerly part of the Parish of Kilbride. The Parish of Grange of Muckamore and Grange of Nilteen were also parishes where the JACKSONs lived and owned property. Tables included beneath will show many of the dates that the family was noted in these parishes. SEE also Blogpost on JACKSONs of Steeple Timeline. ALso the version of The Timeline for the JACKSONs of Steeple on this website. Steeple is a townland in the Parish of Antrim, Co. Antrim. It is just north of the current town of Antrim. At the time of Griffiths Valuation in 1862, it contained 182 acres. It was owned entirely by the by Viscount Massereene and Ferrard who leased the main residence to George Jackson CLARKE, who held title to the rest of the townland. I suspect that all of this had once belonged to the Jacksons of Steeple. Above is Springfarm, with Holywell to the east of it, and Steeple beneath. Steeple is an oddly shaped townland. Do not be misled by the shading - follow the red outlines. Map of Steeple in Taylor and Skinner: Maps of the Roads of Ireland Surveyed 1777. Thomas Hore, [Courtown] to "My dear Percy" [Jocelyn]. "You are both the most active and the most indolent man I know of, allways at Fermannagh and at Creggan both at the same time and yet never out of your arm Chair. Your Brother is not made surveyor of Dundalk as you wrote me word, because he wrote me word it was of Belfast ... How were you able to get this place for him - was it a traffic for that living of Lord Rodens in England? If so it is much to your credit, for you are rich enough and it cannot yet be My Lord (by the bye I do think it a wrong thing that Bishops should be called My Lord ...)"
"These are certainly times in which Clergymen should be particularly active. I mean in their profession and unless aided by the Grace of God I fear all to little purpose. As to my income, it never is in danger here for I live among my uncles tenents and they pay me when they can, and I never yet in my life had occasion to say a word to any person about my Tithes. How it is or will be in the Cy. of Cork I know not, but my heart is not at all in that Preferment and I sincerely hope I shall soon get rid of it for I never should wish to settle there and I never would accept of it and not go there. As soon as I can bring the Bishop of Cork to talk quietly, without falling into a rage I shall tell him this ..."
There can be no doubt that negotiations are going to be opened for a general peace - God grant they may be successfull for then and not till than (if I mistake not) shall we begin to see the cause of God and his Religion vindicated by the breaking out of those intestine convulsions with which France seems at this moment pregnant. ... This Mr. Jackson who is going over to Paris and on whom all our hopes depend was a friend and acquaintance of ours at Turin. He is an unhealthy nervous little fellow but I hope will be strong enough to purchase Peace for us." "We are not so much allarmed in this part of the Country as you seem to be ... Your Political Paroxysms shall not prevent me going to B. Park for a few days if otherwise in my power ... They tell me the North of Ireland is disaffected - is it so? It is a great happyness to be as we are here flanked on one side by the sea, for on that side at least you are sure to have no discontented papists ..."
1698. Lord Masserene and Samuel Shannon of town of Antrim. Copy of Lease. Thomas Shaw about 16 years old son of Wm. Shaw of Bush. William Hartson about 6 years old son of James Hartson of Antrim. James Jackson about 14 years old son of George Jackson of Holywell. Yearly Rent of £5. Dwelling House, etc. - north side of Street, town of Antrim. Farm - 12a. 1r. 16p. north of the High Way leading from Antrim. NOTE: This may be the same George JACKSON who is often described as being of Steeple. 1734-1934 Three boxes of documents relating to the Clarke family, The Steeple, Antrim, Co. Antrim, and the related Jackson family, Ballycastle, Co. Antrim. The documents include miscellaneous leases, title deeds, correspondence, marriage settlements, receipts for stocks and shares, income tax returns, insurance policies and material relating to the Irish Land Commission concerning the land of the Clarke and Jackson families in Antrim. There are also wills of George Jackson, The Steeple, Antrim, 12 Oct. 1734; James Jackson, Loonburn, Co. Antrim, 18 Sep. 1770; Amy Jackson, The Steeple, Antrim, 4 July 1775; Thomas Mercer, Gloucester Street, Dublin, 23 Sep. 1800; and James Clarke, Ballymena, Co. Antrim, 24 July 1810. NOTE: CLARK-JACKSON connection: 348-124-232454. 1782 Jun 27 His will: Thomas JACKSON formerly of Holywell but now of town & of Antrim. 22 Oct 1772. Full 1 ¼ p. 27 June 1782. My wife Rose Jackson. My son Thomas Jackson exor. My daughter Rose Jackson. My two grand-daughters Rose Clark and Elinor Clark. My son William Jackson exor. My freehold lease of Holywell. My lands of Ballynadrentagh [1251 acres in Parish of Killead, Co. Antrim]. Witnesses William HOLMES & Robert YOUNG both of town & Co Merchants & Hugh O’NEIL of the same Linnen Draper... & Thomas DAWSON of Carmony, Co Antrim, Farmer NOTE: There is a townland currently named Holy Well in the Parish of Antrim. It is on the northern border of the townland of Steeple. NOTE: Ballynahadrentagh is near the Belfast International Airport. (see map). By the time of Griffiths, there were no JACKSONs there – but there were SUFFERNs – and given internmarriages a few decades earlier, this could be meaningful. SEE: Baptisms at First (Millrow) Presbyterian. Beaufort Journal. Rev. Daniel A. Beaufort’s travels. Wikipedia: Daniel Augustus Beaufort LL.D. (1739–1821), was an English Anglican priest and geographer, born on 1 October 1739 at East Barnet, as the son of Daniel Cornelis de Beaufort and Esther Gougeon, French Huguenot refugees. He was rector of Navan, County Meath, Ireland, from 1765 to 1818. He would have been known to the JACKSONs because: In 1790 he was presented by the Right Hon. John Foster to the vicarage of Collon, co. Louth. He afterwards built the church at Collon, where he remained until his death in 1821. He was successively collated to the prebendal stalls of Kilconnell, in the diocese of Clonfert, (3 October 1818), and of Mayne, in the diocese of Ossory (20 April 1820). SOURCE: Dictionary of Irish Architects: His design for Collon church (1811-13), inspired by King's College chapel, Cambridge, is probably the best known of his architectural enterprises. 1787-1788 NOTE: Mention of JACKSONs near Steeple, Co. Antrim Near Antrim saw, close to Mr Jackson's at Steeple, a round tower with four windows at top and a pointed cone roof, as usual, but with more large windows than common. I was told by a man in Antrim that the entrance is on the ground and that there is some way of climbing up in it and that there was once a great burial ground about it. --10 Mar. 1718 Rev. Peter Jackson Vicar of Louth to Archbishop of Armagh. Killancoole, Co. Louth. Petition and Opinion requesting the uniting of the parishes of Louth and of Killancoole,Co. Louth. --[c.1718] Rev. Jackson and Archbishop of Armagh. Notes on the Case about reuniting Louth and Killancoole. --16 Jan. 1723 Case and Opinion of Francis Bernard saying that the Vicarage is in the gift of Primate while the Rectory is in the gift of the Crown. The Crown has won the case against uniting. -- 25 June 1722 Letter Rev. Theo. Bolton, Dublin to [ ? ][enclosed in D562/523]. Apologising for not sending Mr Jackson's paper sooner and containing a Query about the tythes of the Monastery of Louth or of the Rectory and saying that if they are part of the Monastery they go to the Vicar. -- [c. 25 June 1722] Review of the Case. Mr Jackson, Vicar of Louth] about the Crown's rights in tythes of Louth and querying the distinction between tythes of Rectory and tythes of former Monastery. -- [c.June 1722] Case of Parish of Louth by Rev- Peter Jackson, Vicar of Louth giving a detailed history of tithes in the parish of Louth quoting Leases and Patents 1540 onwards. -- 18 Jan. 1723 Case of and Opinion on by Francis Bernard. Rev. Peter Jackson Vicar of Louth. Re-uniting Rectory and Vicarage of Louth. -- [c.1723] Francis Bernard's Opinion on legality of Union. Vicarage and Rectory of Louth. -- 28 Apr. Brief for Counsel. Rev- Peter Jackson Louth. Vicarage of Louth. Legality of Union. Co. Louth. -- [c.1724] Francis Bernard's Opinion. Rev- Jackson. Re-uniting Louth Vicarage - Rectory [enclosed in D562/529]. -- [c.1724] Reasons against passing Bill ... for better serving the Right of Advowson and Presentation to Ecclesiastical Benefices. -- [c.1724] Comment on the Case (21 pages) of Rev- Archcbishop of Armagh and Rev- Peter Jackson. -- 16 Feb. 1718 Case of and Opinion of Cornelius Callaghan. Rev. Peter Jackson Vicar of Louth. Rectory of Louth, etc. William McCULLOCH red’d from Peter JACKSON £210 Deed 399.489.264507 19 Sept 1788 Between William McCULLOCH of Ballygilly, Co. Antrim Doctor of Physic & Peter JACKSON [Gent] of Steeple, Co. Antrim ... John McCULLOCH late of Antrim, apothecary., deceased. 25 May 1816 Title from 1707 to 1816 relating to Birch Hill [a townland adjacent to Steeple] near Antrim & lands of Byefield - proposed purchase by William Lyon from Samuel Bristow.1 Mar. 1707 Renewable lease for lives of Called Park Hill (adjoining tenants given) East: John Donnell, James Donnell and Jane Connell; West: John Bell, John Gray and George Jackson; North: Sir Arthur Langford and South: John Duffields, executors of Forrest Shortriggs from Viscount Masserene to Roger Bristow. My Notes from 2006 diary: Lease of Birch Hill lying in the 16 towns near town of Antrim; 120 acres – one of the boundaries is land owned by “Mrs. George JACKSON of the Steeple, formerly Peter JACKSON his father’s to hold to [several names} ... of Peter JACKSON and Thos JACKSON and the survivors ...NOTE: I need to revisit this. NOTE: I suspect that the name Patrick should be Peter. There is a will 1703 for a Peter JACKSON of Steeple. 1833 Loonburn had no substantial buildings. Three decades later, in the Griffiths Valuation, a George Jackson had title to about 170 of the 286 acres in the townland. He likely sub-leased to tenant farmers. He also leased 40 acres directly from the Marquis of Donegal. A leased house with a modest valuation. The holdings were clustered on the western border of the townland, and were small acreages with modest house values. Loonburn had no substantial buildings. George Jackson had title to about 170 of the 286 acres in the townland. He likely sub-leased to tenant farmers. He also leased 40 acres directly from the Marquis of Donegal. 6 - 10 Mar. 1797 At Steeple on the 4th inst in his 24th year, George Jackson Esq., a young man fiercely lamented by all who knew him. 20 Apr. 1798 At Antrim on the 14th inst in the 46th year of her life, Mrs. Jackson relict of the late Peter Jackson of Steeple. re: deed 2 & 3 March 1738 between Frances JACKSON widow of Rev’d Peter JACKSON & the late rector of Killincool in the Co. Of Lowth (Louth) dec’d the rev’d George JACKSON & the only son & heir of the sd. Peter JACKSON, George ADAMS of Heathtown in the Co. of Meath Gent & Elizabeth ADAMS otherwise called JACKSON his wife and only daughter of the sd. Peter JACKSON & Frances JACKSON & Anthony FOSTER of the City of Dublin Esq. With the will annexed of the said Peter JACKSON of the one & James DOBBIN of the City of Dublin Gent of the other ... released 8 tates of Bellelulcashell ... that is to say Kilhavan one tate, Killemurree one tate and half. 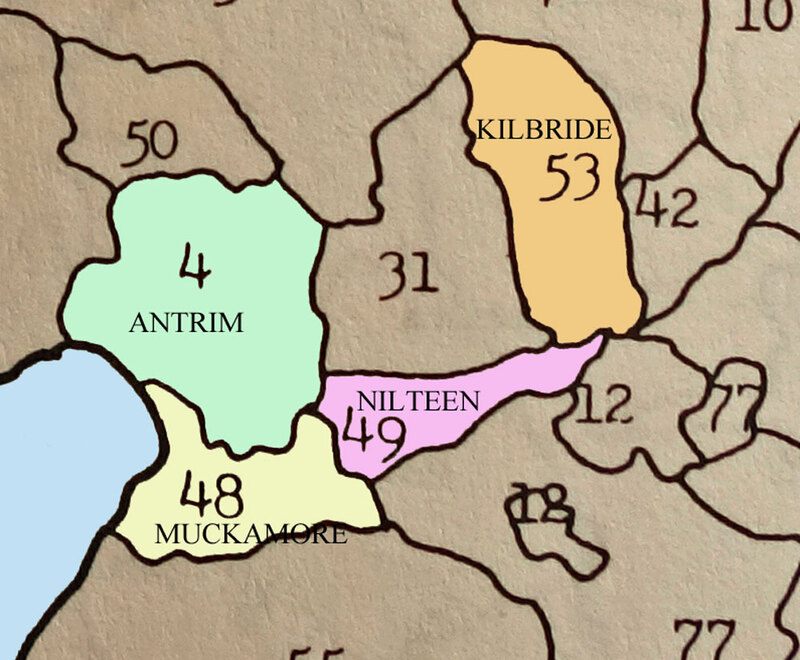 Mullefinegan half a tate Tannafofan one tate; Killaughavare half a tate & Eskar half a tate all in Co. Monaghan & town and lands of Ardpatrick Co. Louth. William McCULLOGH for consids releases unto Peter JACKSON half ten on s. side of street in Antrim above the church together with waste half ten adjoining other half ten - the whole called Lindsays ten + 11 acres Eng measure being part of field called Cotter's hill on left of road from Antrim to Carrickfergus for lives and rent as mentioned. Ann IRWIN formerly in occupation of part of field called Cotter's hill on left of road from Antrim to Carrickfergus. Thanks to Vancouver Mike. Armagh clergy and parishes : being an account of the clergy of the Church of Ireland in the Diocese of Armagh, from the earliest period, with historical notices of the several parishes, churches, &c . James B. Leslie. The Ulster Jacksons: From Cumbia to the White House, Shenandoah and Australia. D.J. McCartney. Carrickfergus Borough Council, 1997. P69: 1683, Peter Jackson, Cordwainer, was included as a Freeman of Carrickfergus. He would have been in the Cordwainers’ Company. SEE: http://www.cordwainers.org/ Their trades included tanners, livery, and shoemakers. The crest included goats – because of goatskins used in the trade. In 1711, a Peter JACKSON is included in the Muster Roll in Col. Edward Jones Regiment. Peter JACKSON and Frances FOWNES married at St. Andrews, Dublin December 22, 1711. This seems to belong here because of the mention of Fownes JACKSON as a witness in Deed: 298-312-197534. On October 30, 1724, Richard and Margaret Tenison, living in Thomastown, Co. Louth, leased to John Woods of Lisnisk, gent., "the fourteen tates in the Ballybetaghs of Ballyfremor and Loughwene or one of them". The lease was for lives, renewable forever on payment of a fine of 20 shillings on the fall of each life. The initial lives were John Woods, Rev. Peter Jackson (rector of KillinCool, Co. Louth), and George Jackson, son of Peter, aged 12 years or thereabouts. Yearly rent was set at 150 pounds.82 By its term of lives renewable forever, this lease automatically gave John Woods a "freehold" in the property, equivalent to ownership in some respects, so that, for example, he and his heirs were eligible to help select parliamentary representatives. 1668. 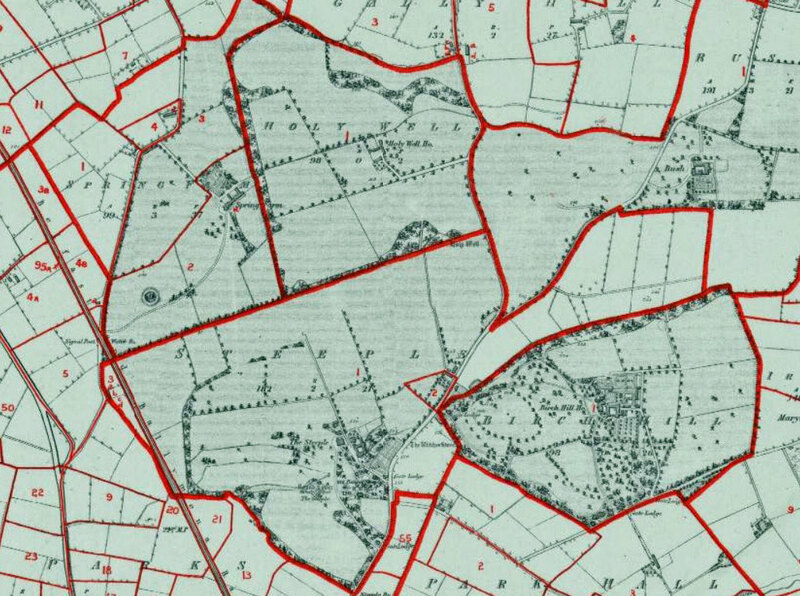 About 249 acres of Tullyvallen, Parish of Creggan were granted to Thomas BALL to the use of Daniel & Sarah JACKSON. In another source, Thomas BALL of Creggan was also listed in Ferguson Certificates as having 5,253 acres as an assignee of Edward Richardson, Ellinor Blackiston, Dan Jackson, Sarah Jackson, Elisabeth Hepburne and Katherine Jones. SOURCE: The History of the Parish of Creggan in the 17th & 18h Century. L. P. Murray, Isaac Dobson, Wm. Frankland, J. Southey. Journal of the County Louth Archaeological Society, Vol. 8, No. 2 (1934), pp. 117-163.